For the last five years he had not visited France, the country which has translated and published the largest number of his works, some twenty novels and collections of short stories mainly published by Le Seuil and Editions Philippe Picquier. To mark his visit, an international seminar was organized in Aix en Provence, dedicated to his work, many meetings with his readers and the release of two books by Editions du Seuil. 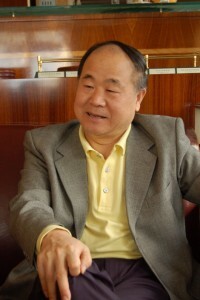 The role of these participants who have supported the work of Mo Yan for years should not be underestimated; in the first place, Noël Dutrait, professor of Chinese language and literature, who translated with his wife Liliane, who died four years ago, major works of two Nobel Chinese writers, Mo Yan and Gao Xingjian. The seminar was also an opportunity to highlight the value of the first book in French language devoted to this novelist by Zhang Yinde (1), professor of Chinese studies in Paris3 Sorbonne university and author of numerous works on Chinese literature. This book “His realm of fiction,” analyzes the topics and words of Mo Yan under his literary realm, the township of Gaomi in the Shandong Province, the birthplace of Mo Yan and which, after his Nobel Prize, is becoming a tourist mecca. The author also examines the major novels and underlines the present day and the political content of the topics chosen by Mo Yan in his literary commitment. The translator Sylvie Gentil (2) could comment on the translation of several chapters of the”Red Sorghum Clan.” This novel, was published in 1989 by Actes Sud but only the first chapter. Sylvie Gentil has revised 25 years later her translation and translated the other four chapters. She points out that the novel which was completed in 1986, is one of the most famous because of Zhang Yimou’s film which was a worldwide success. Also it is a cult book in China that was not criticized even after the award of the Nobel prize. ” Sandalwood death “but probably one of the most endearing. During a meeting with the public in the City of Books, which gathered at least 300 people, Mo Yan refered mostly to his childhood, his youth and his village. Excerpts from his autobiographical novel “Change”, was read to the public and showed that the novelist could handle humor and fantasy. This small book was translated into French by Chantal Chen-Andro (3), who signed the translation of several great novels including “Life and death are wearing me out” and “Frogs”. Mo Yan has also referred to the impact, not always positive, that the Nobel has had on his life: even with sun glasses, his round head is easily recognizable! He regretted the obligations he has now and that sometimes prevent him from doing his job, telling stories. Mo Yan publishers were present whether Philippe Picquier, or Anne Sastourné of Editions du Seuil, who mentioned her collaboration with Mo Yan for many years. The next day, surprise, Mo Yan visited the beautiful Granet Museum with the curator, Bruno Ely. A museum displaying, for a few days, a magnificent series of paintings from the Pearlman collection. We did not know his interest in painting and her daughter was able to photograph her ​​father before major works but especially in front of the great “Jupiter and Thetis” by Ingres, a very kitsch picture! (1) Yinde ZHANG, “Mo Yan, le lieu de la fiction”, ed. Le Seuil, 315 pages, September 2014, € 21. (2) Mo Yan, “Le clan du sorgho rouge”, translated by Sylvie Gentil, ed. Le Seuil, 440 pages, September 2014, € 23.50. (2) Mo Yan, “Red Sorghum” , translated by Howard Goldblatt, Penguin (reissue) 1994. (3) Mo Yan, “Le Grand Chambard”, translated by Chantal Chen-Andro, ed. du Seuil, 2013. (3) Mo Yan, “Change”, translated by Howard Goldblatt, Seagull Books, 2010.
the 29, at 18:00, a meeting organized by The Phoenix Bookstore and the 30th In the National Library F. Mitterand at 18h30.